A tour of the National Museum in Bangkok, which traces the early Thai civilizations in the region and the history of subsequent kingdoms, is like taking a stroll through the corridors of time. The short tour gives the visitor an overview of the history of the kingdom spanning several thousand years. Our tour starts with the origin of early Thai civilizations in the first section in the National Museum. There's evidence of civilizations dating back to the early Stone Age from relics discovered in Lampang and Mae Hong Son in northern Thailand and Krabi to the south. Civilizations existing around 3,600 BC were discovered in Ban Chiang,Udorn Thani in northeast Thailand as well as Kanchanaburi and Chonburi. However, there are conflicting theories as to where the early immigrants came from. Please see map to the National Museum. Until the discovery of the Ban Chiang settlement in 1966, there was only sufficient evidence gleaned by the National Museum to show that Thai civilizations only existed for as far back as 1,000 years ago. We know now that early settlements existed in Thailand as far back as 3,600 BC. This is based on the age of the artifacts discovered in the Ban Chiang which has been designated an UN World Heritage site in 1992. 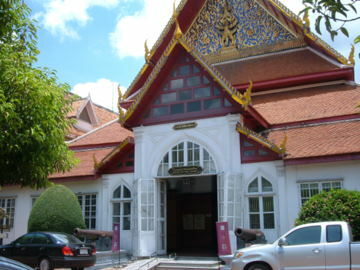 The Ban Chiang Collection can be viewed at the Suan Pakkad Palace Museum. Though the age of the civilizations can now be accurately determined, there are still conflicting theories regarding their origins. It's generally believed that Thais originally migrated from southern China about 700 years ago. Recent discoveries have however thrown more light on this issue by the Fine Arts Department. In 2003 more than 200 old skeletons were found in ancient graveyards in Nakhon Ratchasima or Korat in NE Thailand. These skeletons were dug up in Noen U-Loke and Ban Lum Khao graveyards, near the Prasart Pimai historical park. Archeologists have determined that the bones from Noen U-Loke are 1,500 – 2,500 years old, those from Ban Lum Khao 2,500 – 3,500 years old! These bones were subject to mitochondria DNA tests and the results compared with similar tests made on living communities in eastern China. There were striking genetic similarities. From these discoveries, it can be concluded that Thais originated from China and migration to north eastern Thailand took place as early as 3,000 years ago. The introduction of Buddhism in Thailand in 5th C AD by Indian scholars was followed by a gradual increase in Indian influence from 6th – 7th C AD. Chinese scholars in the Tang dynasty 7th – 8th C AD have mentioned in their writings the existence of a civilization in central Thailand straddling the trade routes between India and China. Archaeological evidence has also indicated that Dvaravati, the ancient civilization, thrived between 6th– 11th C AD in the Chao Phraya basin. These are the present day provinces of Nakhon Pathom, Ratchaburi, Lopburi, Singburi, Chainat and Suphanburi. This civilization which had a profound impact on Thai art, culture and religion also extended its influence in north, north-eastern and southern Thailand. The next section in the National Museum covers the 7th – 13th centuries when the Khmer empire based in what is now Cambodia, was at the height of its power. The influence of Khmer culture covered the northeastern region of Thailand and extended all the way to Lopburi in central Thailand. Historical sites like Phanom Rung in Buriram and Phimai in Nakhon Ratchasima are testimony to this influence. The Sukhothai section of the National Museum reviews the rise of this 13th century kingdom which reached its pinnacle under the reign of King Ram Khamhaeng from 1279 – 1298 AD. Sukhothai not only grew in political and military stature, it was renowned for its art, architecture and culture. It was King Ram Khamhaeng who started the Thai alphabet. 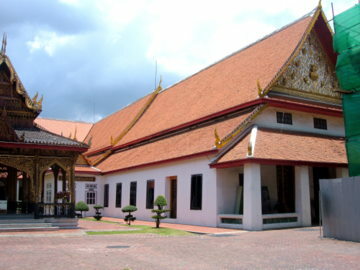 The Ayutthaya section in the National Museum is the most substantial. Founded by King U-Thong in 1351, Ayutthaya was a city bounded by three rivers, the Chao Phraya, Lopburi and Pasak. It grew rapidly and soon eclipsed Sukhothai and the other kingdoms. At the height of its influence, Ayutthaya was a major commercial center with three main palaces within a walled city with its network of roads and canals and protected by 16 forts. Trade with China, Portugal, the Netherlands and Japan flourished. Ayutthaya was captured and sacked by Burma in 1569. The city was revived in 1584 by King Naresuan. Unfortunately it was overrun again and completely destroyed by the Burmese in 1767. Built up over four centuries, Ayutthaya with its 34 kings from five dynasties crashed to an abrupt and tragic end. 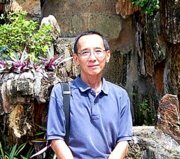 It was left to Phraya Taksin, son of a Chinese immigrant, who escaped the destruction of Ayutthaya to reestablish a new capital in Thonburi. In a series of campaigns he drove the Burmese out of Thailand and reunited the various kingdoms. The grand finale in the tour of the National Museum covers the Chakri dynasty started by King Rama I in 1782 when he established Bangkok as the new capital to restore the former glory of Ayutthaya. It was the dawn of a new era, Rattanakosin. After a massive Burmese onslaught was repelled, they were never a serious threat again. The prospect of a united Thailand with secure borders became a reality. Under the reign of the Chakri Kings, the next 200 years, saw the gradual emergence of a modern Thailand. 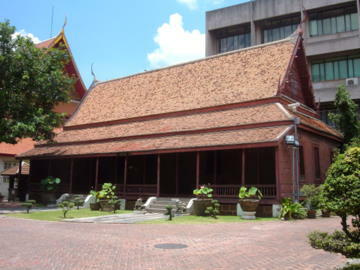 The National Museum in Bangkok captures several thousand years of the history of the early Thai civilizations, the rise and fall of the various kingdoms and dynasties to the present. It encapsulates the cultural ballast and very soul of the Thai nation. Photographs are not allowed inside the museum but you are free to take photos outside the buildings. There are a number of beautiful buildings on the grounds behind the main building. 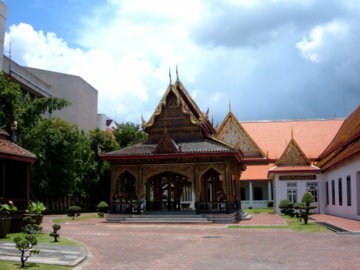 The National Museum is at the northern edge of Sanam Luang. Take are Chao Phraya river boat to N9 Chang Pier then walk along Na Phra That Alley to the museum.